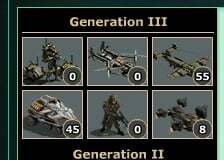 Does anyone know for sure what the gunships get a level 10? More splash? I heard more splash at lvl 10 and more ups at lvl 20 but thats only what I heard. Would like to have this confirmed. This whole post is a joke,heavily outdated and its made by a dude who make unoriginal contents. I never expect this post to rise up again,I have a better one to release,this time its original. If the Mods don't close this post due to Necromacy,I'll edit it to match today's standards. Still junk at level 8. We'll see if they're any good when they get to level 20 or if they're going to go into the bin with the rest of the failed units. Bad advice on the Bishop. Their mark doubles the damage buff to 20% at level 20. That with their reload/charge buffs makes them a powerful addition to almost any platoon, not to mention the future aura tech releases promised. Oh, and if I'm not mistaken, they get a speed buff somewhere, as I recall them having a speed of 3, but after upgrading to 20 I noticed it doubled to 6 somewhere along the line so they can keep up with light vehicles like Technicals. dont see how it would be necromancy if its just been ongoing. try to hit base online with it see who long bishop will last 3-4sec? They're nice with Galen/Caretakers and Legendary Laser Tanks. When Caretakers are spent, their speed can work against them, but aside from that, they have 600 range and don't need heavy armor. Better durability and a way to slow them down would be nice, of course, but they're great, especially for PvE. I use them way more often than not. Their huge health can keep their survival time longer while flying above full defense bases packed with anti AAs and ADs. But the huge repair time actually restricts most players from spamming the Gunship,I mean,no one wants huge repair times.